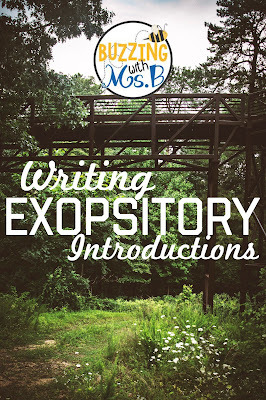 Good Expository Introductions... it's time to let "Hi, my name is..." go. Hi, my name is... Today I'm going to tell you about... Did you know... BO-ring! All of those are pretty uninteresting. But sometimes, that's all that students know to do when they're writing an introduction. Expository writing can be especially difficult, as students tend to use the above beginnings when they write about a topic. 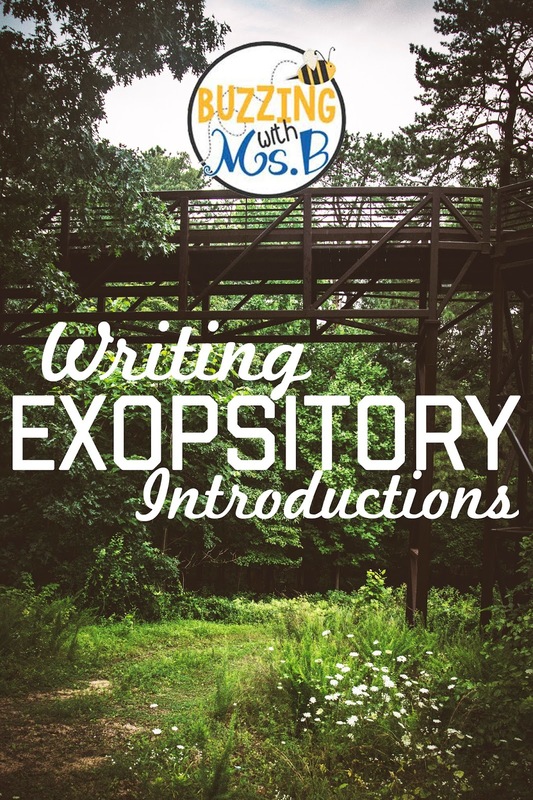 To help them develop a better sense of what makes a good introduction (we're specifically calling them introductions in expository, rather than 'beginnings', in the hopes of differentiating from a narrative), we planned the following lesson. We chose to initially focus on three different types of introductions. Asking a question, a surprising fact, and description. Each of these needs to relate and include the central idea of the essay. Instructional Sequence: 1. Share a model introduction. 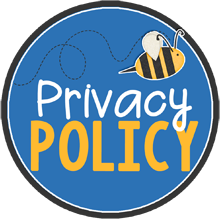 Good sources for this include Time for Kids, Sports Illustrated for Kids, etc. A real introduction from a real text is especially meaningful. 2. Discuss as a class - What did the writer do in that introduction? and Why should you use this strategy in your own introduction? 3. The teacher models writing the type of introduction about her own central idea. 4. Students practice writing that type of introduction about their own central idea. After the teacher has shared, modeled, and students have written their own, they choose the best one for their piece. Maybe I was mean when I was a classroom teacher. I can distinctly remember students asking at 8:00 on Valentine's Day, "When're we gonna pass out the sugar high-inducing stacks of sweets I brought?!" and I said, "Valentine's Day starts at 2:00. Don't ask about it again or it's not happening." This wasn't always the case. I usually tried to find a way to integrate something about the holiday into the current focus for reading or writing... or math... or something! To help you do the same, and avoid the cruelty that is the conversation above, I've put together several Valentine's Day themed products, available on TPT. 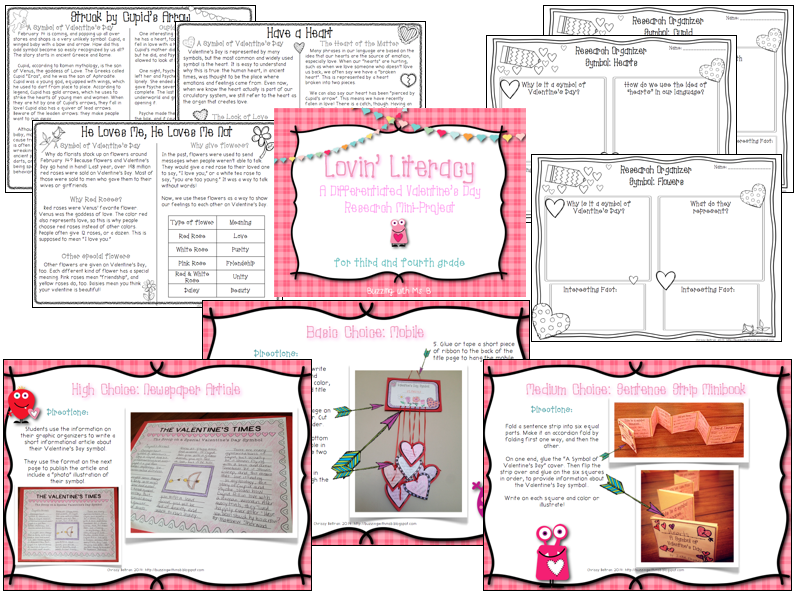 Literacy Products Lovin' Literacy: Valentine's Day Research Mini-Project Differentiated tools to read and gather information on Valentine's Day symbols, and represent it in a fun project! Sweet Treat Word Work Pack Centers or Stations activities to practice rhyming words, syllables, and parts of speech. Designed for second and third grade. 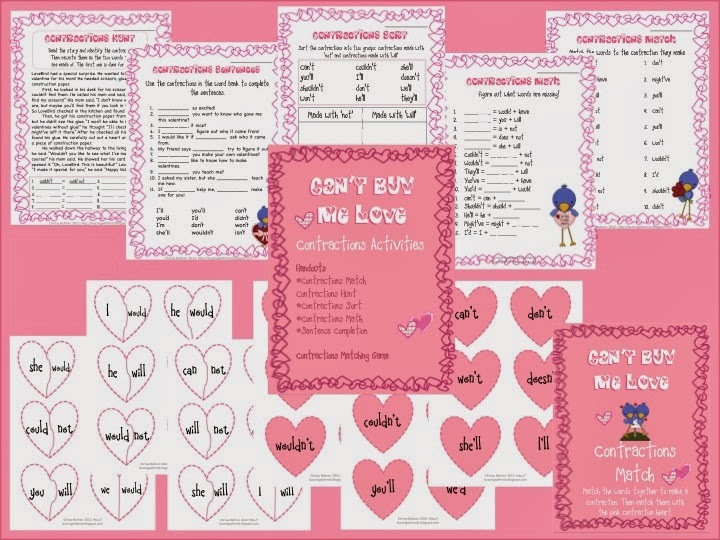 Can't Buy Me Love Contractions Activities Heart-shaped contractions matching center or station and five handouts to practice contractions. Designed for third grade. LoveBugs Synonyms and Antonyms Pack Center/station activities (great as file folder games) where students match synonyms and antonyms. 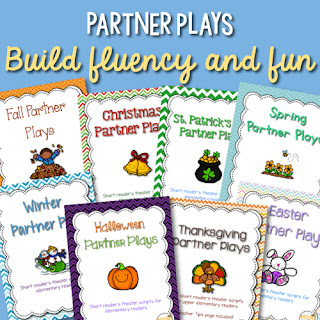 LoveBugs Plurals A cute center/station activity to help students practice how to make a singular word plural - when do you add "s" and when do you add "es"? Designed for third and fourth grade. Sweet Stuff! Valentine's Day Math Centers or Stations Centers for fact families, adding and subtracting 3-digit numbers, multiplication facts, and odd/even. Designed for third grade. 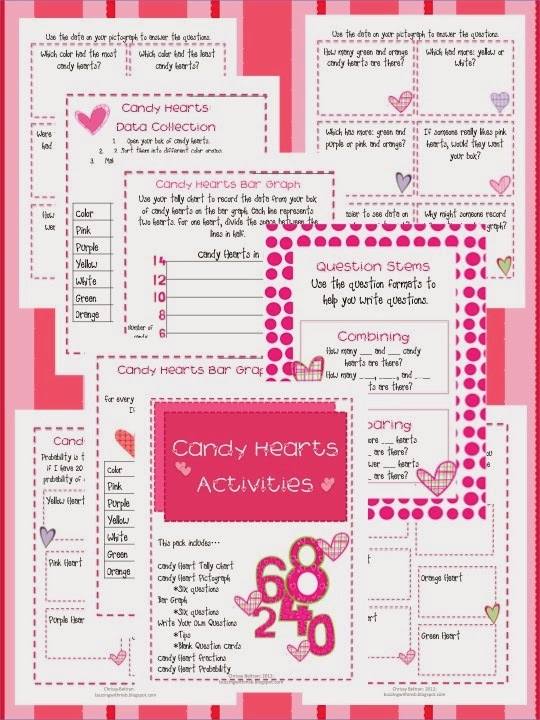 Valentine's Day Graph Activities Bar Graphs & Pictographs with differentiated questioning! Designed for third grade. Candy Hearts Math Use candy hearts to teach basic graphing, fractions and probability! Designed for third grade. 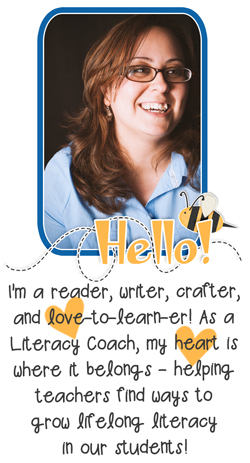 As a Literacy Coach on my campus, one of my main roles is to develop teachers' (and my own) professional knowledge in the areas of reading and writing. 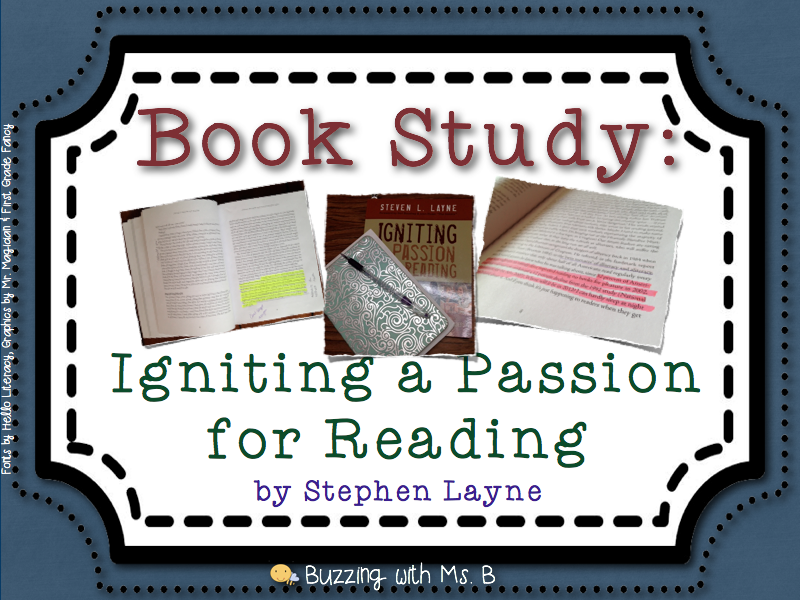 I'm so excited this year about a new way I'm trying to do this: a professional book study! Last year at a Book Fair, I saw this book and had to buy it. It addresses exactly the issue we'd like to learn more about! How do we get our kids to become engaged readers who choose reading? I read the first chapter and realized I had to share this great book with my teachers, too, so I set up an optional book study. I invited teachers to participate and my principal approved purchasing the books. After teachers told me that they were interested, we ordered the books and set our reading for the first session: Chapters One and Two. Last week, we met to discuss the first two chapters. As we settled down to discuss, one of the teachers told me, "I'm going to be honest." (Don't we like to say this when we think our listener won't like it?!) "Please do!" I said. "Over winter break, when I thought about reading this book, I looked at it and thought to myself, 'Why did I sign up for this? I don't have time for a book study!' And then I made myself read the first chapter and I thought, 'I love this book!'" She's not the only one I heard this from - several teachers stopped me in the hallway to tell me how much they enjoyed the book! Yay! It's a challenge to find a book accessible to so many teachers who are so very busy. This book was a great choice. Here's what we talked about during our book study! This chapter is basically an argument for us to realize the importance of aliteracy, or people who are able to read but don't. Layne explains that this is more of a danger and issue in America than illiteracy, as a higher percentage of people are aliterate than illiterate. 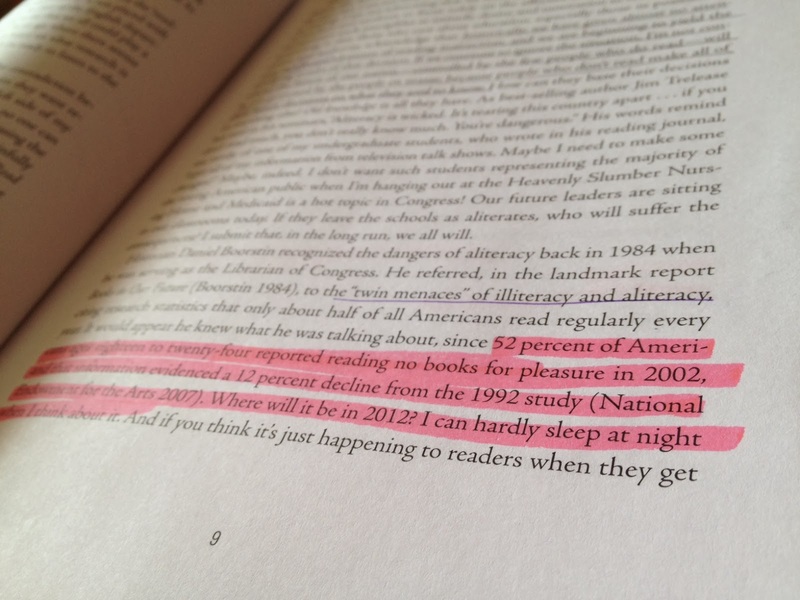 This is the quote I highlighted from that section: 52% of Americans ages 18 to 24 reported reading no books for pleasure in 2002, and that information evidence a 12% decline from the 1992 study. What?! Over half of Americans read not one single book for pleasure in a year?! That's surprising to me. I guess a percentage of those people are unable to read, but a large percentage must be able but choose not to. And that it's declining is horrifying - what will that percentage look like this year? Does anyone read anymore? So clearly, it's important to not only teach kids how to read, but to engage them in reading for enjoyment. If you believe, as I do, that reading is a choice and that it is not humanly possible to make anyone of any age reading anything, then perhaps some time spent looking at how we can impact students in such a way that they will be more likely to make the choice to read deserves our attention. Yes. It does. Because we are constantly engaged in the mechanics and comprehension of reading, our students do not develop the love of reading. And because at home, they are constantly engaged in the mechanics and comprehension of video gaming, soccer practice, and all other hobbies/enterprises/activities, they aren't choosing to read. 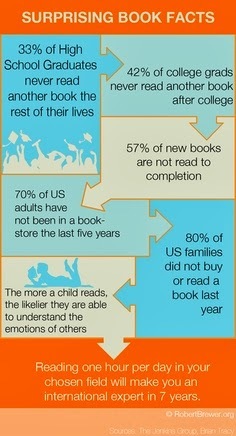 And what's more, we can't make them choose to read. That's what Chapter Two is about. He's a smarty pants, isn't he? It's true. If you know your readers, you can better engage them in a book that will resonate with them. In this chapter, Layne shares a few strategies for doing this. Ok, so every year in August, I'd hand out a reading interest inventory to my kids and teach them how to fill it out. I'd collect the inventories and stick them in a folder with my other "documentation". And then I'd forget about them. I may have pulled out one or two with my more struggling readers, but I can't think of a time I successfully used one with my aliterate, or able but unwilling readers. Layne explains that if we try to tackle everyone, it's impossible. And unnecessary! Why hunt for special books for Tony when Tony reads all the time? So he suggests that we target a few students and review their surveys. And then go book shopping. Do we have to be told twice to go shop for more books? He goes book shopping for his disinterested readers and then hands them the book saying what he calls four magic words: "I thought of you." Who doesn't want to be thought of? Often, this encourages kids to read the book you've shared with them, and that might be the book that helps them realize the beauty and joy of reading. Another strategy he writes about is setting goals. Not only does the student set goals for their reading; the teacher does as well. These goals could include how many minutes you'd like to spend reading per day or week, the genre of books you read, the number of books, or reading books by a specific author. Hats off to a New Year! Goal-setting product on TPT. 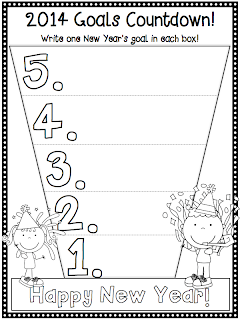 Then he writes his goals on a large chart and records the students' goals on a handy sheet. This sheet is posted in the front of the room, at the back of the room, on a clipboard, on his desk, anywhere he may need it to confer with students about their progress toward goals. As the year progresses, he follows up with individual readers about their progress toward goals in a simple, conversational way. He'll ask about how they're doing with reading more historical fiction and share a little about his progress toward reading more scientific texts. It's a pleasant way at moving readers toward more mature reading decisions. So that's our first book study session. I'm so excited to meet with my teachers again this week to discuss the strategies that he shares in chapters two and three! Check back again to read more about our conversations and learning! Why did I spend half an hour making Chinese lanterns out of construction paper? Because this month, our school-wide Book of the Month is Ruby's Wish! 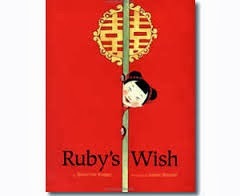 Ruby's Wish is a great story about a little girl who lives in China in the past. She is part of a large family with many, many children. The boys in the family are treated specially and allowed to go to school with no other responsibilities. But Ruby wants to go to school, too! She shows her grandfather how much she wants to go. I always get choked up at the end, even when I read it to the teachers (so embarrassing). 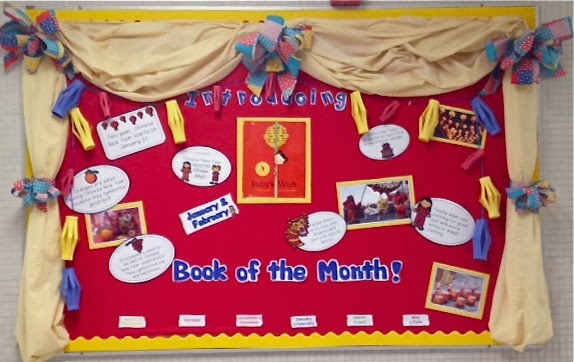 So this month, to display the Book of the Month, this is the bulletin board I put together. The curtains and the "introducing..." part are always up for the Book of the Month board, but we change out the cover and the other materials on the board with each new book. 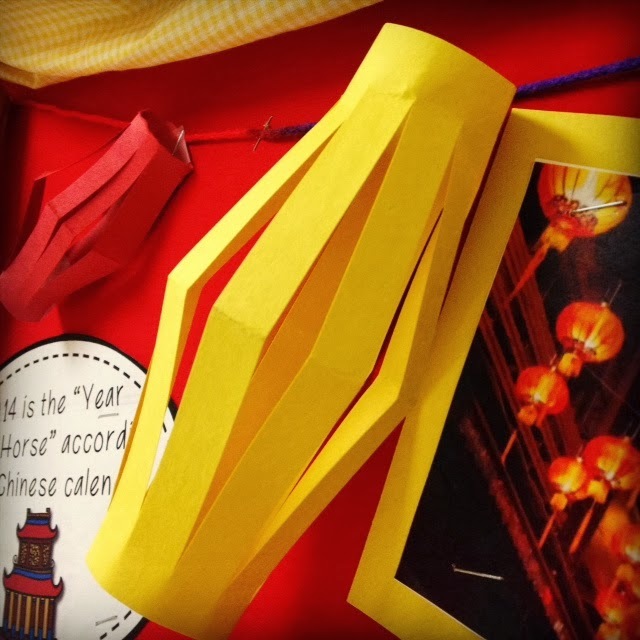 This time, I opted for some fun facts about Chinese New Year (which Ruby celebrates in the book. 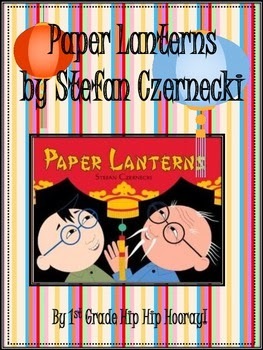 And I learned to make the Chinese lanterns from this TPT freebie from First Grade Hip Hip Hooray! 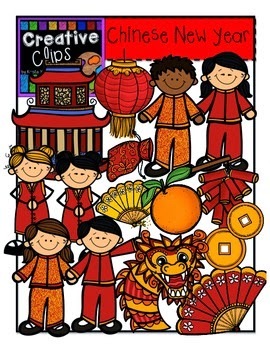 Will you teach your kids about Chinese New Year this year? What will you do? 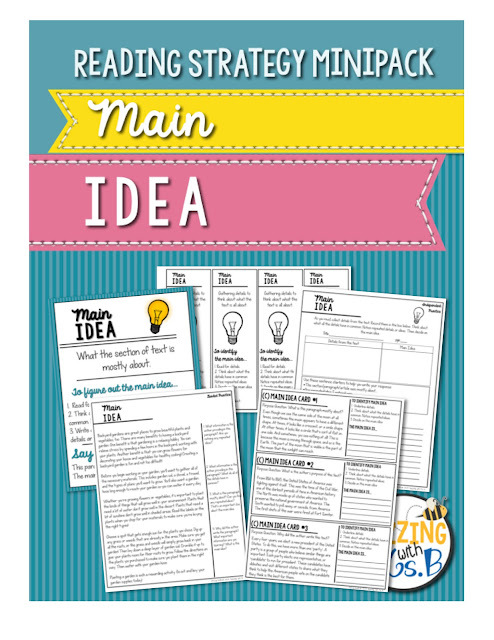 Expository Text: Main Ideas Anchor Chart & our upcoming plans for third grade! Main Idea is really hard. For third and fourth graders, anyway, it can be a challenge. Once, my class and I were reading a short text about Abraham Lincoln. It gave details about how he had to walk miles to school, when there was a school, and how he did his reading by candlelight. He had to chop firewood and do all sorts of difficult things to survive as a kid. As we were reading this, I could see how the students were reacting. "Wow," they were thinking. "Harsh." So when I asked for the main idea, I was a little surprised at the idea they came up with. "Life was hard in the 1980s." WHAT?! Ummm.... yeah, but not as hard as it was in the 1800s! Anyway, kids are goofy, so something we think they're getting the big idea, but they're missing an important piece of their comprehension. Like the century or something. Basically, students in groups get a bag with several items all connected to one idea. They have to identify the supporting details and then put them together to make a main idea. 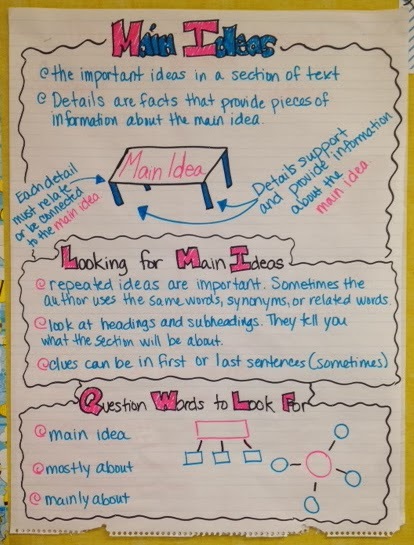 Then, we'll practice identifying the main ideas of an article. Teachers are going to use the Bamboo Bears article from the Austin ISD Language Arts Resources site as a source of text. 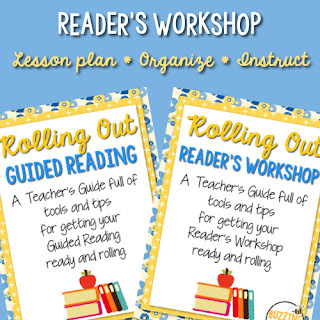 The teacher will white out the subheading for each section and have students use the details in the section and the repeated ideas to create the main idea statement, or a new subheading. Afterwards, they can check it against the original subheadings! 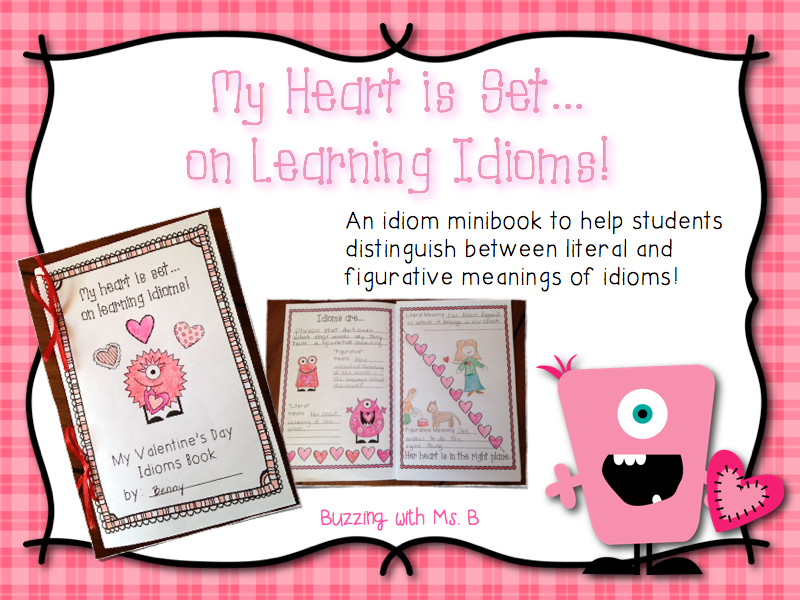 It's a fun and engaging way to practice identifying the main idea! 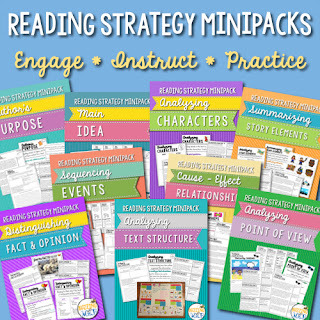 To teach main idea using the gradual release model, check out my Reading Strategy Miniack: Main Ideas. 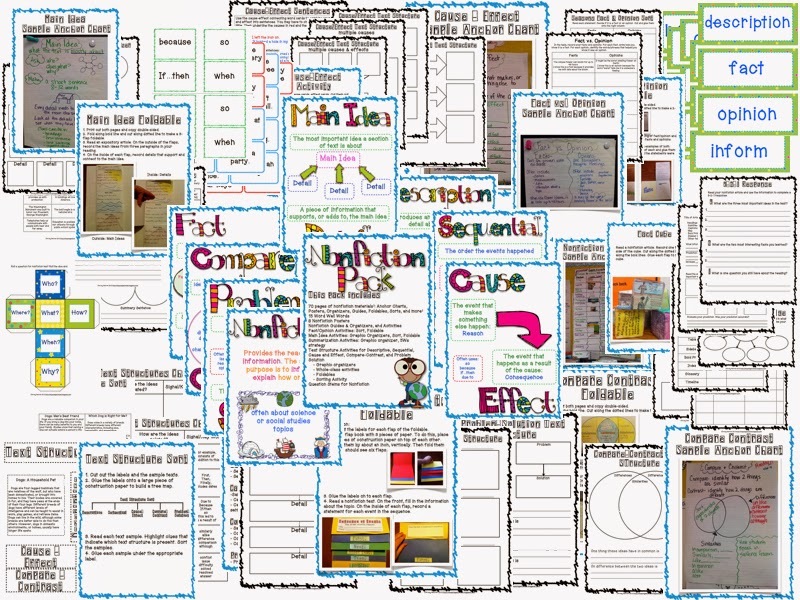 We're going to follow up with some tools from my Nonfiction Pack to help kids practice main idea in a variety of ways: sorting, graphic organizers, foldables, and more! 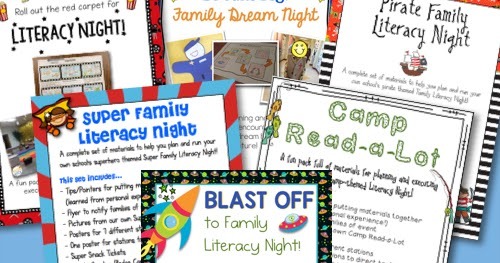 Get all 65+ pages on sale this week for 5.00 on TPT! I don't know how to watch basketball. I stare at the screen, watching sweaty men run back and forth. They dodge and leap, pass and receive, their shoes squeaking on the floor and the buzzer sounding, "AAAAAAAAAAAA!" And I don't get it. I mean, I get the basic idea. Two teams in different colored uniforms, ball in hoop = points. But I watch it and my eyes don't move right. They bounce from one player after the other, trying to locate the ball. They skip across half the court searching and once I find the ball, that player passes it to someone else and I've lost it again. Someone once told me it's because I don't know what to look for. "Don't follow the ball," he told me. "Notice the movement of the two different teams. Watch the collective team by looking at the movement of the colors in the uniforms. Don't focus on the ball. You can't keep up." This helped (the one time I practiced it) but I didn't practice it much. I didn't practice it because it's hard to watch and I didn't want to. Baseball, however, is comprehensible to me. I'd rather watch baseball. This understanding helps me when I think about reading instruction. 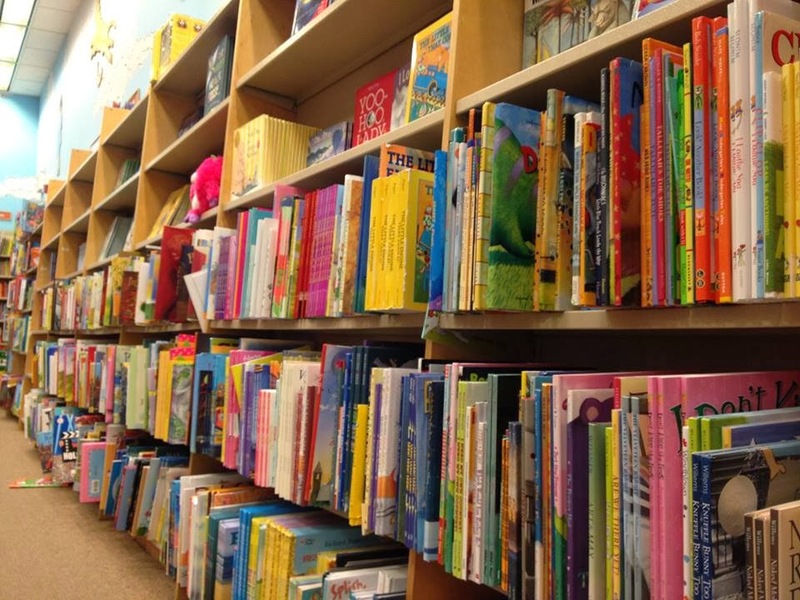 Studies show that kids read everything like fiction unless we provide specific genre-based instruction. They look for a character and a story in all texts, unless we coach them in what to look for. That was the rationale for this anchor chart. 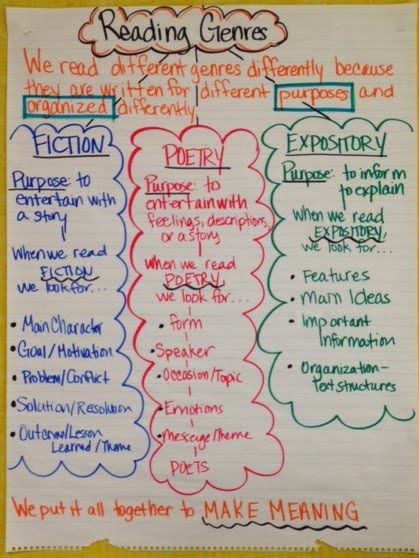 To create the chart, we wanted to pass out a variety of texts that are either fiction, poetry, or expository. We have previously taught the genres of fiction and poetry, but expository text is something new for our kids (as a genre of reading). Students will identify the genre of each text and then use it to review the characteristics of fiction and poetry. The teacher will create a chart from the students' background knowledge. 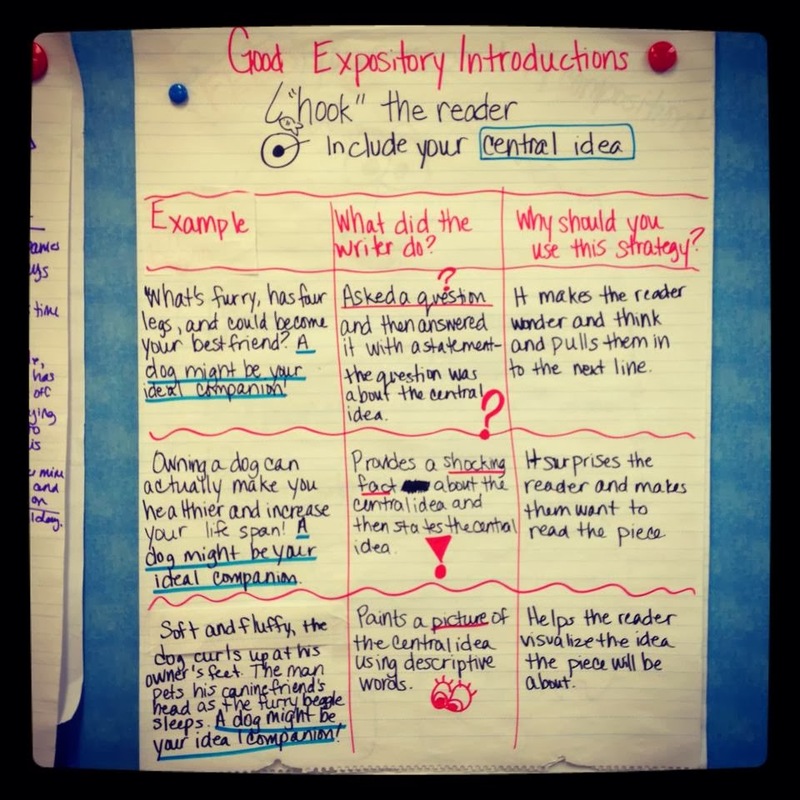 After the first two columns are complete, the teacher will directly introduce the purpose and characteristics of expository texts. The idea behind this is the same as helping me learn how to watch basketball - it helps kids know what to look for in a text. If I pick up a text and say, "This is fiction. I'm going to look for a main character who has a problem and solves it," that gives me some mental velcro to stick the important pieces of the story to. If I pick up an informational text and say, "This is expository text. I'm going to read to be informed about a topic. I'll look for main ideas of each section to find out what's important," I will be prepared to read that text and pull out what's important. It's all about making meaning! And kids who make meaning of text are more likely to read something. Which is why I hate basketball. I love winter break. I can stay up as late as I want, and when I know I can stay up till two thirty, I seem to get more done during the day. I'm a night owl. I'm envious of people who are morning people but my natural time clock says stay up till two thirty and sleep till eleven. That's so not going to fly next week when I go back to work. Maybe I should make getting up early one of my New Year's resolutions. Ehhhhhhh nope. Tonight in my keyboarding frenzy (with a glass full of chocolate vodka - thanks, Mom for the gift- and Dexter on Netflix) I worked and worked on a cute idea I had for a bulletin board display to help kids think about their goals and resolutions for the upcoming year! 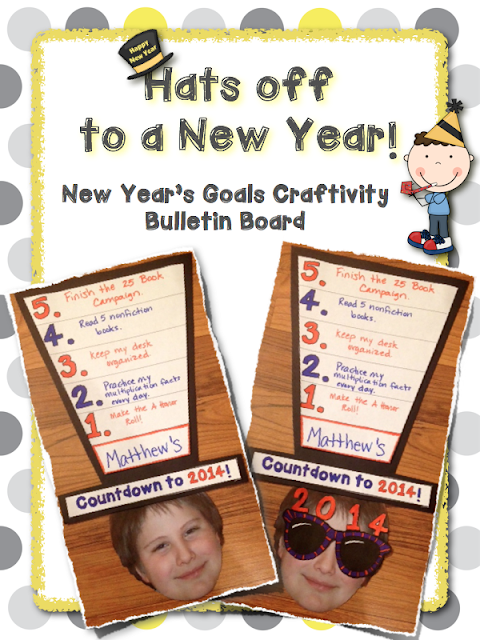 For only 2.00 at my TPT store, you get materials for the craftivity and a bulletin board display! 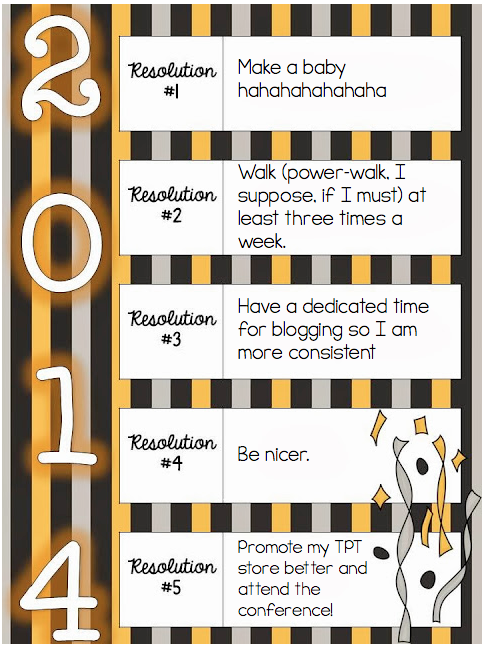 And if you'd like a little taste in the form of a freebie, check out my Countdown to New Year's Goals freebie on TPT! Happy New Year! This past year has been incredible. 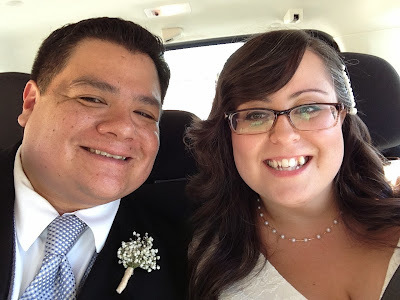 It was in this year that I married my wonderful hunnybun and that my beautiful niece Olivia was born. These two huge milestones for our family have been so exciting and made 2013 a special year for us. Olivia was born in mid-September and she is my favorite person. We're so excited to start trying to have one of our own in 2014. The hunnybun and I got married on October 5 and it was such a beautiful day full of our families and friends. 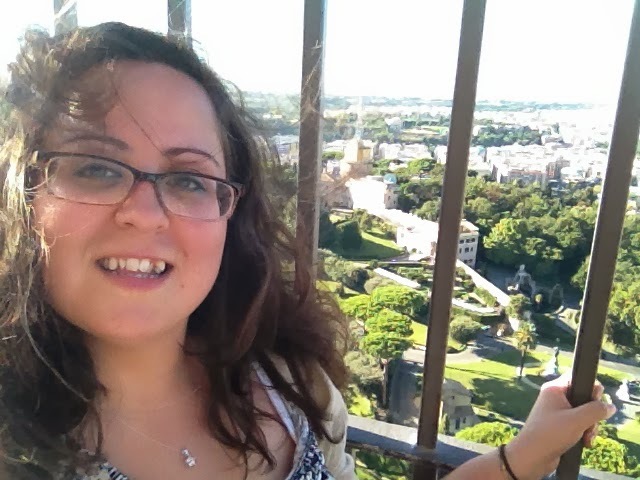 and I walked up the tiny narrow stairs to the top of St. Peter's Basilica! Incredible days. Of course, some crummy stuff happened too in 2013. Not too crummy; just a little crummy. I gained, like, ten pounds, my brother and sister-in-law (and favorite person Olivia) moved to another city in Texas - it was a great opportunity for them, but I miss them a lot, the hunnybun has had some tummy trouble, I was told I had a heart murmer - and then told nevermind (yay) and I had my wisdom teeth out. If you haven't seen the video, you should click over and check it out. Worth the five minutes, I've been told. So 2014 has a lot to live up to. I've got some big plans (I say this as God laughs, so they say) and we're hittin crunch time when it comes to familyville. 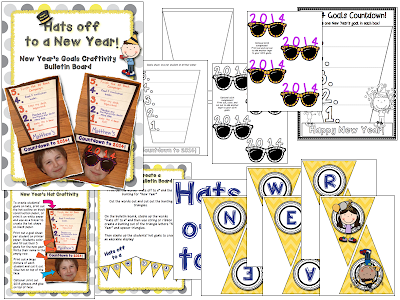 So here's the plan for 2014, courtesy of Second Grade Nest Linky Party! My first personal goal was to make a baby. That might sound silly, and you may be thinking that's not something I should share with the world haha. But too late. I already did. I'm an open book, people, and 2014 is the year of baby. I'll keep you posted on progress. So when I recently went to the doctor, he told me my hormones were weird. Like, he showed me a little graph and he said, "We like to see a difference of no greater than 3:1." And I'm good enough at math to know the ratio was more like 4.5 :1. And so I said, "Ummm....could that explain the bouts of crying over commercials and my wont to snap at my husband when he says things like, "Can you do me a favor?" and he said....yes. So yeah, I've been a bit snippy around the house with the hunnybun and I should be nicer. I go from Mary Poppins to Sweet Dee Reynolds in twenty second. So I'll work on that. This year, I'm starting a book study for my teachers K-5. 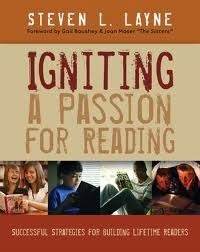 We're reading Igniting a Passion for Reading by Stephen Layne and our first meeting is January 7! I'm excited to start this book study because it's completely voluntary and I believe that's when staff development works the best. So my goal is to have a successful book study with my teachers to help us all grow in our reading instruction and grow our students in their independent reading habits. I also want to set up a little library full of multiple copies of books so students can check out books to read in pairs or groups. 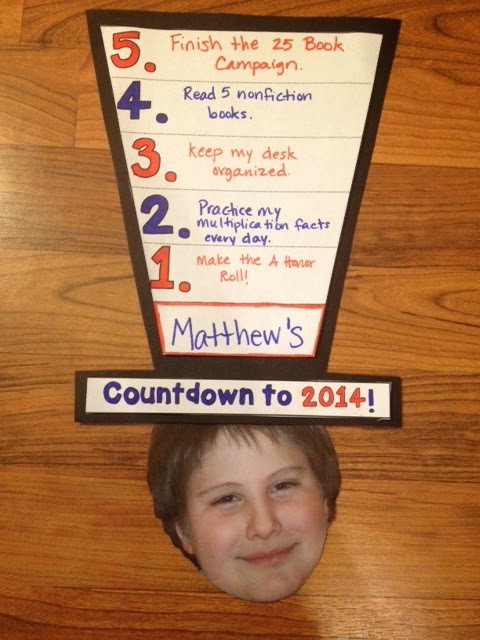 I think it's a great way to motivate our readers who are reluctant and also to engage our very able readers! 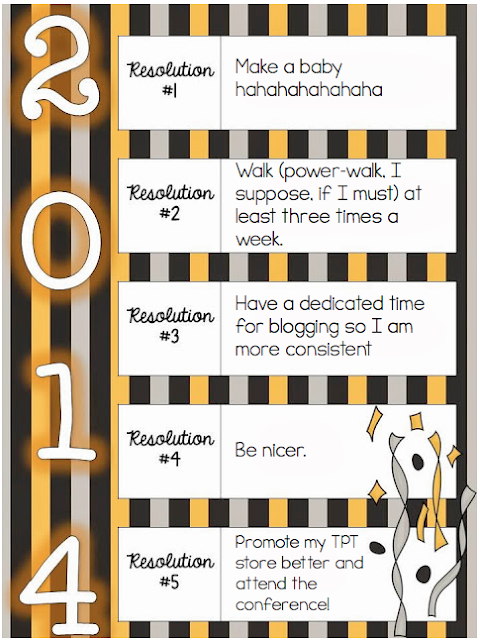 I want to learn more about promoting my blog and my TPT store, and making it more like a business. I love blogging and working on products, but I feel like there's more meat to it and I want to learn about making this more of a priority! I want to walk three times a week at least. I like to walk once I'm outside, but when I'm in my cozy toasty house, it's tough to pry myself off the couch, out from under my laptop and drag myself out the door. Also, once I get there, I'm supposed to walk faster that I usually do. Because strolling don't do nothin for my hips. So check out Second Grade Nest and get inspired to work on your own goals!